What do you do for Valentine's Day? Stephen and I have never been overly into February 14th. Most times, we'll grab dinner at one of our favorite restaurants, cook dinner together, or order pizza. I normally get him a funny card and some candy or a little gift card to his favorite lunch spot. Nothing too fancy. 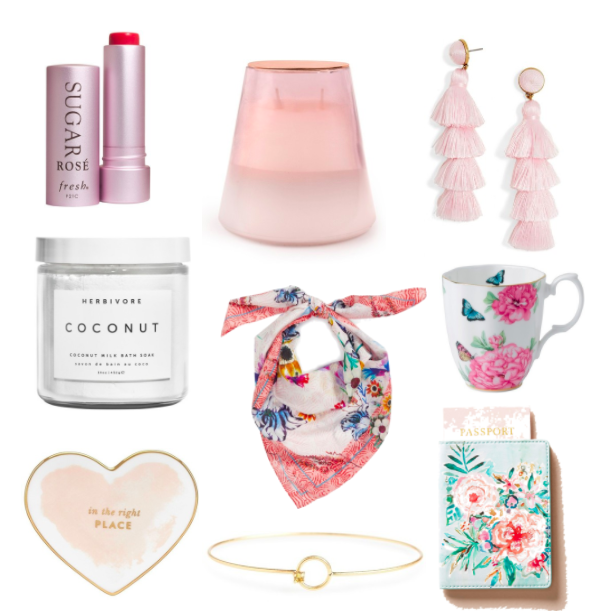 It is fun to show someone you love them on Valentine's Day, so here are a few cute gift options for your mom, bestie, or... ladies, send this to your boyfriend/husband as a little gift guide! Each item is under $50! In my opinion, you can never go wrong with a wonderful candle. It may seem impersonal to some, but I have candles burning in our home pretty much any time we're in it, but it's something I don't always buy for myself. Nothing beats hopping into a bubble bath or bath soak with my favorite candle for a long day. And for the coffee lover? Set out a cup of coffee for your loved one in a gorgeous new mug like this one. I love the beautiful details and gold rim of this one. Are you and your loved ones big on Valentine's Day? How do you celebrate?